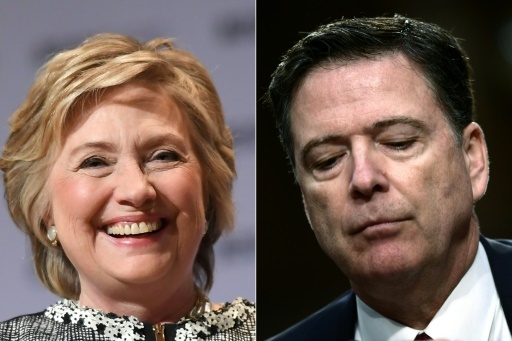 Washington (AFP) – President Donald Trump wanted prosecutions opened against his 2016 election opponent Hillary Clinton and ex-FBI director James Comey, according to a report in The New York Times on Tuesday. The report, quoting unnamed sources, said that Trump’s wish earlier this year prompted his then White House lawyer, Donald McGahn, to advise him to hold off, because he’d be opening himself to accusations of abuse of power. The Times said it was not clear what alleged crimes the president wanted to order the Justice Department to look into. It said that McGahn, who has since left the White House, advised Trump that he could face the risk of impeachment if he took such a measure. Trump leads chants of “lock her up,” referring to Hillary Clinton, at his political rallies. He fired Comey last year and accuses the former FBI director of breaking the law when he gave information to the Times about interactions with the president. The report about Trump’s alleged move to push the Justice Department into prosecuting opponents comes as he faces accusations of seeking to tamper with a probe by special counsel Robert Mueller into his election campaign’s alleged collusion with Russia. Featured Photo: AFP/File / ANGELA WEISS, Brendan Smialowski. A report said Donald Trump’s wish to prosecute Hillary Clinton and James Comey prompted his then White House lawyer, Donald McGahn, to advise him to hold off, because he’d be opening himself to accusations of abuse of power.